Hrithik Roshan, just 3 years old as an actor, has already figures in Top 10 people of bollywood. It's not just good looks, a phenomenal debut Kaho Naa Pyaar Hai which overnight instant him to super stardom or 2003 biggest commercial and critical success Koi Mil Gaya. Hrithik Roshan has a stirring sincerity towards his work that sets him apart. The trade predicts he will be the next superstar after the powerful Khan's. He is the son of Rakesh Roshan. Has two thumbs on his right hand that are grown together. He is having a sister called Sunaina. He had married to 'Suzanne Khan' daughter of Sanjay Khan on 20 December 2000 who was his girl friend from long time. He can't handle money. His wife and parents are taking care of the financial details. Has been called the Indian Sylvester Stallone, Brad Pitt and Michael Jackson rolled into one person. The country wide hysteria following the release of his first film Kaho Naa Pyar Hai in 2000, is known as Hrithikmania and is unprecedented. The look of his muscular, chiselled body started a fitness boom in India. He often supports charities of various kinds and known as a perfectionist and control freak. He wanted to quit the film business altogether after his father Rakesh Roshan was shot at and wounded by hitmen sent by the Bollywood mafia, but changed his mind. He prepared for 2 years himself, extensively for his screen debut, taking acting, singing, dancing, fencing, riding etc. lessons. He also worked hard on his diction and physical appearance (strenuous workout routines). Fought hard to overcome a stammering problem. Worked for many years on the sets of his father Rakesh Roshan in various functions, including sweeping the floor and serving tea to the stars, to learn the business from scratch. Believes in the good in every person, a character trait often misinterpreted by others as gullibility and/or naïvety. He got 30000 (!) marriage proposals on Valentine's day 2000. Hrithik's first movie role was as a child artist when he was six years old in the 1980 movie Aasha, where he played an extra as a dancing boy. He then appeared in Aap Ki Deewane (1980) and Bhagwan Dada (1986). Hrithik debuted in Kaho Naa... Pyaar Hai opposite debutante starlet Amisha Patel in 2000. The film was directed by his father and proved to be very successful at the box office: It was the highest grossing film of 2000 and winner of the Filmfare Best Movie Award. Hrithik's performance earned him the Filmfare Best Debut Award and the Filmfare Best Actor Award. That year, Hrithik also starred in Fiza and Mission Kashmir. Though they were not as successful in the box office, both were highly acclaimed by critics. Hrithik was nominated for Best Actor in Fiza and Mission Kashmir was nominated for Best Film at Filmfare. In 2001, Hrithik appeared in two films. Yaadein was his first critical/commercial disappointment. But Kabhi Khushi Kabhie Gham did extremely well at the box office becoming the second highest grossing film of 2001. Hrithik had a tough year in 2002 when all three of his releases were box office failures, including the much-hyped Na Tum Jaano Na Hum and Mujhse Dosti Karoge!. In 2003, he played the male lead in Koi Mil Gaya, Hrithik's first film directed by his father since his debut, was the highest grosser of the year and also successful at the Filmfare Awards and Hrithik was awarded with his second Filmfare Best Actor Award. The actor had only one release in 2004, Lakshya, directed by Farhan Akhtar. Lakshya did not do as well at the box office as expected but Hrithik's performance was appreciated by critics. 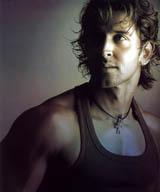 Hrithik took a two-year break from acting before resurfacing with the superhero film Krrish which released in June 2006. The movie, which is the sequel to his 2003 hit Koi... Mil Gaya, also stars Priyanka Chopra and Naseeruddin Shah and is once again directed by his father Rakesh Roshan. At the box office, Krrish has also been hugely successful. He is currently filming for Dhoom 2, a sequel to the 2004 hit Dhoom in which he plays a villain role for the first time. The film is due for release in November 2006. He was the victim of a defamation campaign in late december 2000. Rumors were spread that he stated in an interview that he hates Nepal and its people. This immediately led to riots in Nepal, cinemas showing his films were attacked, posters burnt, Hindi movies banned in general for some days and several people shot dead by the police. The events made headlines all over the world and the governments of Indian and Nepal got involved as well. Anti Indian / Hrithik sentiment died down quickly when it became clear that the alleged statements were a fabrication and the rumors were spread by a malicious third party, possibly the Bollywood mafia, still pissed about not getting the foreign rights to Kaho Naa... Pyaar Hai (2000). Nepal born actress Manisha Koirala played an important role in getting the news to the people in Nepal that the accusations were false. In January 2001 Hrithik Roshan was again involved in a controversy. This time about a poster created and used by the Democratic Alliance in South Africa in November 2000 to woo Indian voters. The poster used his face without permission. The ANC reacted angrily and threatened to ban his films.